Replacement Router Bit for the Rockler Inlay System (#25229, sold separately) and the Inlay Bushing and Bit (#27593, sold separately). Works just like the original that came in the Inlay Kit. It cuts clean, lifts away dust and chips. the bit worked as expected, I slowed down router to keep bit from burning up. Great bit. Cuts very clean. This little router bit is tuff ! I work with exotic HARD woods and they never lose their sharpens ! Just make sure to use a plunge router hand plunging is its only weakness . But that should be common sense ! Because I'll probably break the bit that comes with the inlay system. Just in case. Always have 2 of every bit. We just needed another one. I need to kerf a project . I use Rockler for all my replacement router bits. I have always been satisfied with the quality and service. It was suggested by a Rockler rep.
BEST ANSWER: This is a 0.125" spiral upcut bit with a 0.250 shank. The depth of cut is 0.500". What is the diameter of the router bit & shank? BEST ANSWER: BIt diameter is 1/8th. Shank is 1/4. These bits work extremely well, and can last 100's of uses. Highly recommended. 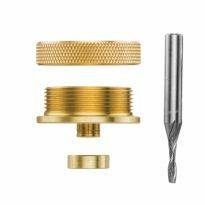 Is it a down cut spiral bit? 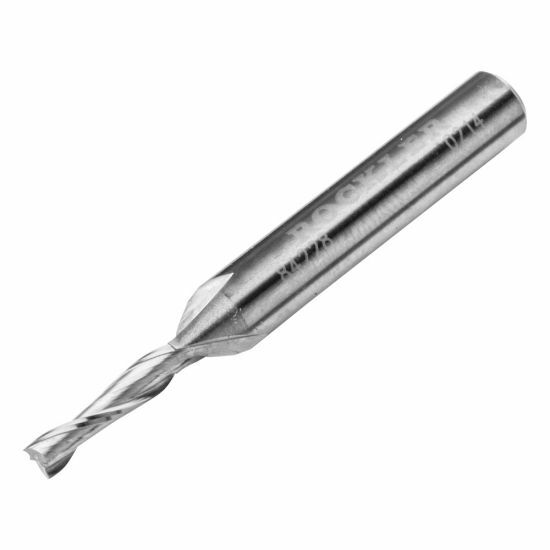 BEST ANSWER: This is a spiral upcut bit.